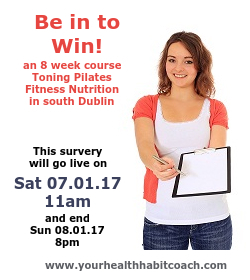 Update (Sunday 08.01.2017 – 9pm): I decided to extend the deadline for the survey-submission by one day to Monday 9th January 2017 – 9pm – to give my Morning Class Participants and south Dublin Personal Training clients also a chance to participate. 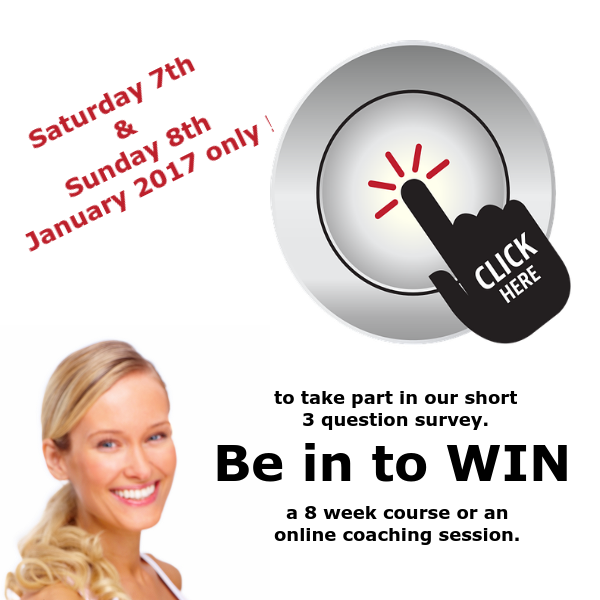 This online-survey (click here) will go live on Saturday 7th January 2017 – 11am and will be open until Sunday 8th January 2017 – 8pm. it is very short, just three questions. 1. One Personal Training session (1 hour) if you live in the Dublin 14, 16 or 18 area. 2. One Online Fitness, Exercise Training or Nutrition Coaching session (1 hour). 4. Mens Pilates & Core Conditioning Classes in Sandyford, Leopardstown, Dublin 18 or Dundrum (if availability allows). Find a full Fitness and Exercise Class Timetable for my south Dublin based classes here.